Traditional cycling Jersey. Cycling is a sport rich with traditions. We embrace the past but enjoy the benefits of modern textile technology in our cyclewear production. For over 35 years, Aero Tech Designs has created cycling apparel to keep cyclists comfortable on their bikes. 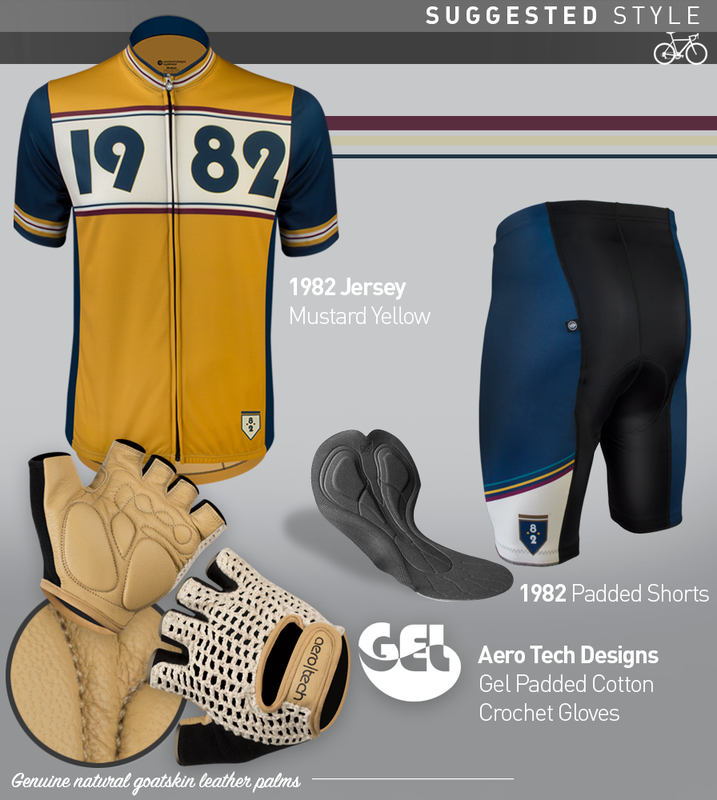 The 1982 cycling kit is a reflection of our past tradition and heritage with all the benefits of what we have learned today. The 1982 Vintage jersey is available in two colorways. A deep teal green and a more visible mustard yellow. Both call on traditions of the early 1980's with the striped sleeves which conjure up the old wool knits from that era. The stripes are distinctively male and the design is classic, yet brilliant. This is the standard sprint fit cycling jersey that is trim but feels loose and airy. The fit is a classic here at Aero Tech Designs. The sprint jersey is a classic casual fit that is assembled from 100% polyester AeroDry™ fabric with set-in sleeves and tagless labeling. A full length separating zipper with a pull tab. The back has three pockets that are easy to reach and roomy to hold water bottles, food, and extra clothing. Three generously sized rear pockets are designed for easy access, but tight enough to keep water bottles and nutrition bars inside safely. Pockets are reinforced for long life. The 1982 vintage cycling jersey is available in sizes X-Small to 5XL. Hand crafted in the USA. The cycling jersey's bottom hem is slightly elastic to hold the garment snug to hips to keep it in place and prevent flapping in windy conditions. The neckline has a tagless label. This exciting vintage cycling jersey has vivid color and texture. 3M Reflective tab on the middle pocket adds value for visibility in low light conditions. 3M reflective is known worldwide as best in class and will aid in visibility. The reflective tab reflects light back to the source and is positioned for maximum visibility. AeroDri™ is a wearable tech fabric that manages moisture away from the skin and through the clothing for evaporation. Moisture management is one of the key performance criteria in today’s apparel. Moisture management is the process of transporting moisture away from the skin to the garments outer surface Moisture management often refers to the transport of both moisture vapor & liquid away from the body. Wetting and then Wicking is the nature of a technically designed fabric. In the heat summer and athletics, trapped sweat can heat up the body and lead to fatigue or diminished performance. When wearing a garment manufactured with AeroDri™ , the moisture vapor can pass through openings between filters of yarns. The polyester fibers are extruded in an angular shape and then knitted into a highly technical two stage fabric surface. The technical composition of fiber, fiber shape and knitting process all support the maintenance of body temperature. When the body temperature heats up, sweat is produced. With a cotton garment, the sweat leads to "wetness" and increases clothing weight - especially in sweat prone areas like the neckline and arm pits. This wet is perceived as uncomfortable and with a negative effect on performance. Moisture management with AeroDri™ leads to temperature control and enhanced comfort. Keeping cool with technical performance fabric means moisture management. Temperature control can be achieved by evaporation of water on the skin's surface. Crafted with pride in the USA! Factory Direct Price and Value! 1982 Sprint Shorts are available too!